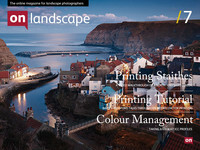 David creates contemporary landscape photographs using traditional large format film cameras. Unsworth Photographic is, quite literally, a cottage industry – the processing and printing of our photographs is still done by hand with old school wet chemistry. This issue we're talking to Angie and David Unsworth, a photographic team (how novel) from Grasmere in the Lake District. A former painter, David works with his partner Angie to create beautiful images, nearly all taken within 10 miles of their house. A recent self published book (reviewed elsewhere this issue) is the first half of a pair that documents their experiences walking in the fells. The second half will cover Autumn and Winter to the Spring and Summer of the current publication. You can buy the book from their website listed at the bottom of this article. In most photographers' lives there are "epiphanic moments" where things become clear, or new directions are formed. What were your two main moments and how did they change your photography? The fact that we (myself and Angie) work as a team is I suppose the initial spark that lead me to my work in photography. Up to then I worked as an artist for 15 years; self obsessed, very driven but very solitary - you may say I was the classic Ruckenfigur. The idea of working as a collaboration seems so obvious now but at the time it was revelatory - a complete change in direction. A new media with its challenges and potential and the thought of working creatively with another person was both frightening and wonderful. Several years ago whilst scrambling in the depths of Tilberthwaite Gill I met a collector of 'suiseki' (or near mountain stones). This is the traditional Japanese art of choosing and displaying stones which resemble the wider landscape or mountain form. After that chance meeting I began searching for these stones myself and became fascinated by their encapsulation of the wider landscape. This near, far relationship and ambiguity of scale was a major influence on my life as an artist, and still resonates in our photographic work today. I have always been intrigued by the Ruskinian "truth to nature" ideal. As a painter one can manipulate the landscape for effect by bringing out form, texture and hue to maximise the emotional content. I find the discipline of photography, of having to work in an entirely subtractive way, very challenging but hugely rewarding; all we have is what is in front of the lens - and this is all we really need. Beauty by subtraction and the romantic movement's most powerful legacy - the fragment - inform all our photographic work. Much of your photography has been taken with a 10 x 8 camera. How and why did you decide to use such a beast given the distances and heights you walk for your photographs. I guess its back to the "truth to nature" ideal. Working in 10 x 8 strips all the peripheral workings of a camera away. It's photography pared down to the bone - no lens distortions, no compression of verticals, no compromise. I rather like the physicality of the large cameras. Like painting, you feel involved with the creative process; compositional subtleties become apparent and you work very closely with the subject. If some aspect is jarring it is immediately apparent on the huge ground glass screen. These subtle nuances of form are lost when using a smaller format: nothing gets quite as close as the 10x8 to the reality we see around us, and the resulting huge transparencies are just stunning. The fact that in changeable weather, which we often work in, you very often have only one chance to make a photograph gives a tension and coherence to the photographic process and demands an intuitive approach. Thus, what to many must seem like an archaic method, becomes its appeal. I can see why this is not a common method of photography in an upland environment - carrying 35kg of kit around will never appeal to many, but it does seem to suit us. You work as a team and credit your photos with both of your names, how do you split the technical and creative parts of your work? It's actually very easy. Angie and myself have an uncanny ability to tune into the same features in a landscape. Angie has a natural eye for strong composition and you can't teach that. Having a dual credit also gets past the problem of ego; this is our work. Coming from that theme, do you argue over compositions? Coming as we do from completely different photographic backgrounds (mine in the fine arts and Angie's in reportage) we seem to "see" the landscape in a very similar way. In any creative partnership this is incredibly rare and means we are in tune with each other and the wider landscape. (Angie says the subject matter seems to detach itself from the rest of the scene and look more in focus. She feels magnetically pulled behind the eyes when confronted by something which compels her attention). Angie often pushes me to seize the moment - I am far more likely to say "we will come back another day" if things are not just so. We are very lucky that we live and work in the landscape we photograph. Our house is out on the fells above Grasmere, in the heart of the Lake District, so we both live and breathe the landscape every day throughout the seasons in every conceivable mood This undoubtedly helps us see the subtleties and potential and gives one a sense of getting under the skin of a landscape. It is a slowing down process, spending time in the landscape, working with it not taking from it. Your photographs are quite dynamic for someone who uses 10 x 8 - how do you find your compositions? I rather suspect that the compositions find us....... We like the idea of working in challenging conditions. One of the most useful items in our kit is a lightweight tent, in fact many of our photographs could not be made without it. Used as a day shelter it keeps wind and rain, snow and hail off the camera and gives us a safe, warm place from which to work. If we are somewhat comfortable we can spend hours, even days out on the hill, slowing right down into the rhythm of the landscape. We often make only a single exposure in any given day - clarity of vision is everything. Of course many times the moment you plan for simply does not happen, so we pack up and go home. We never feel cheated though; as every hour spent in the field leads to a greater understanding of the landscape and ourselves. I believe you were an art student. Did this prepare you for photography? Most of my inspiration and personal philosophy comes from the art world. My references are underpinned by my experiences as a professional artist for the previous 15 years before the switch to photography. I firmly believe that photography is a valid means of artistic endeavour. Having worked in both disciplines I see far more similarities than differences. Yes, photography can be populist and crass but so too can the art world. There is more common ground than many may suspect. It's particularly pleasing to see the Lake District portrayed in such a fresh way. Do you have any advice for photographers wanting avoid cliche in the Lakes? In an area such as the English Lake District it is easy to believe that little remains to be discovered. Our advice to anyone visiting the Lakes would be to slow right down. Spend time in the landscape before reaching for the camera. Do not become a copyist; get off the beaten path and explore, both imaginatively and physically. Actively trust your own creativity, spend more time looking at your immediate surrounding: the Lakes excel in their mid-distance scenes and details. And remember it is your own interpretation. You have published your own book. Could you tell us a little bit about the ups and downs to this process and would you recommend it to other photographers? You are another camper like Tristan Campbell - does living in the landscape for a daily cycle change the way you see it? Undoubtedly. Time spent in a landscape is I believe fundamentally important to the creative process. I met a Japanese calligrapher a few years ago who told me that in her work 99% of the time was spent in thought and meditation, grinding the ink, preparing the paper and practising the movements necessary for fluidity in each character. Then in two or three intuitive moves her work was complete. I cannot think of a better analogy for the methods of spending time in the landscape. Chance favours the prepared mind. What sort of things do you think might challenge you in the future or do you have any photographs or styles that you want to investigate?. At the moment we have only made photographs around our home patch. In fact all our images have been made within a 10 mile radius of our studio. The next great challenge is to take our camera (and our philosophy) to other areas. Where this will be and how we will achieve this we are still investigating but that is the obvious next step. We are also in the process of setting up a wet darkroom, though trying to fit a 10x8 enlarger into a 16th century Lakeland cottage is proving to be quite a creative challenge in itself. And thanks for Angie and David for another great interview - you can see more of their work at Greenburn Publishing.